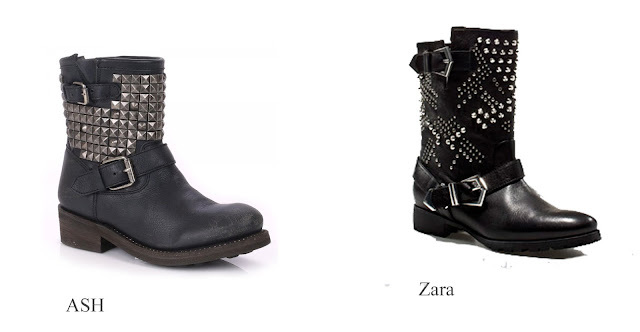 With fall/autumn season approaching super fast, I am in NEED of new biker boots. Did I mention that they HAVE to be studded?? It will be a staple of this fall fashion and I just wouldn't be able to live without it. The last ones I owned were from New Look, and in one season I wore them to pieces... Not sure if it's my terrible habits or the bad quality, but I don't want to have that happen to me again. So, this year I am researching from better brands. The above babies are from Kurt Geiger (£180) and below ones are from Zara (£100) and Ash (£280). Obviously the prices are varies but aI want to make sure these ones will last me at least 3 seasons :-) Also, Ash doesn't seem to have my size currently in any of their stores :-( I kind of prefer them as they are much more chunky and hard than Zara or KG. I can not make up my mind. Which ones are your favorite? Other good suggestions would be much loved too! Love the Ash, though it seems quite expensive! But still gorgeous. Wild boots! I think I like the last pair. I just followed you. I hope you visit my blog and follow if you like. In the end, I found the ones i really liked in River Island! A bargain as well :-) All Saints didn't have the studded ones at the time.